Found in Italian American communities, especially Utica N.Y. Served at Room temperature. Made with Crushed tomatoes and Parmesan cheese on a precooked pizza shell. so it's just crushed tomotos and parm cheese??? I love tomatos but that seems like it would be a little bland. Sounds like it would be a good snack. Not bland at all! We've had this a few times in Utica and, correct me if I'm wrong here ynotryme, but the crushed tomatoes seem to be cooked down but still lumpy, fairly sweet, and just a little spicy. And the cheese is sharp. It's truly addictive. Seems to be all over Utica. We remember it used to be the same way in Binghamton in the 70's but for some reason, it just doesn't exist there anymore. Someone needs to do a full Utica tomato pie survey - a very worthwhile task! I became familiar with this version of tomato pie when I lived in Utica, NY. I still have it on occasion when I visit there. I find it unique and tasty. It is not at all like a pizza. Nor is it like Trenton, NJ tomato pie. I would highly recommend it to any one visiting in the Utica, NY area. However, I worked with a guy from Bethlehem, PA who used to bring it to work on occasion. I never did find out where he bought it. Preheat oven to 450°F. Stretch the pizza dough to cover a greased cookie sheet. Dough should be fairly thick (about 3/4 inch). Allow the dough to rise a bit while the sauce is cooking. Heat a saucepan on medium, add the olive oil and garlic, and sauté until the garlic is just golden. Add crushed tomatoes and oregano. Cook until the sauce is thickened, about 15-20 minutes. Cool the sauce to room temperature. Top the pizza dough with the sauce and then bake in 450°F oven for about 15-20 minutes. After removing the pie from the oven, sprinkle with the cheese. Let the pie cool to room temperature before eating. Recipe by Frank DuRoss Jr.
That is the same pizza seerved at Senape's, called "pitza"; see the other thread related to this. I've never seen it other places, but I've spent no time in Utica, either. Mosca, The pics of Pitza appear to have Mozzarella on them. Tomato pies don't. Like them though, slices of tomato pies are sold at gas stations and convenience stores. They are a great, quick snack, esp. on the go. P.S. I knew a lot of Mosca's growing up in Rome N.Y. When I lived in Utica (1985-1992) I used to call the meal served during the holiday season "The Utica Buffet". It seemed like they always served it at work for what used to be called a Christmas Party. A lot of people also served it at home. The buffet was sausage & peppers, baked ziti, at least half of a tomato pie, and tossed salad or antipasto with Italian dressing. It seemed like I would eat this meal about a dozen times (exaggeration) between Thanksgiving and New Year. I managed to sample a lot of tomato pies during that time. Akavar, add baked chicken to the list and you have the meal served at most weddings in the Utica-Rome area. Hhmm - I don't remember baked chicken. Of course now you get chicken riggie's at a lot parties. Senape's has a lot of Romano cheese as well. The mozzarella is probably a regional variation of a regional variation! There's a similar type of pizza that's popular in RI. I don't think they use cheese at all, but have a nice spicy sauce. Typically it comes from bakeries, but when I was a kid it was sold at convenience stores, candy stores and the like in basically 2" x4" strips, wrapped in wax paper printed with the bakery name. They sold for about the same price as a candy bar. It was pretty co mmon for kids to go to the penny candy store and get a slice of pizza (and yes, it was just called pizza). another popular food from CNY is sausage bread. you spread dough out like for a pizza, crumble precooked Italian hot or sweet sausage and mozzarella cheese on top, roll it like a jelly roll, pinch the ends. apply an egg wash, bake at 400 until golden brown. some people add peppers, onions and either spinach or greens before they roll it. some add sesame seeds on top of the roll before they bake it. served sliced. good both hot or room temperature. Don't forget mushroom stew. I would love to have a recipe for that. Thanks for the tip about Easton Bakery. I will have to try that. Please kepp me in the loop re the Coney Island visit. I would really like to do that one. Maybe it was just my neighborhood, or the time. We didn't start calling them pizza "strips" until around high school (mid-70s). The tomato pie I grew up with is a bit different. 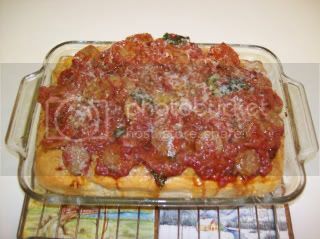 Its a real tomato type pie, take a pie crust and slice up fresh red tomatoes with other seasonings and bake in the oven. Serve room temp. Looks dry to me...and that sauce better be great...seems on this kind of pie the sauce is everything!!!! I dunno Lee.. Looks like a decent amount of tomato on top (even soaking into the crust there). A year later, that slice still looks darn tasty! Maybe grate a little more parm on top of it though..
Looks good Porkbeaks! Is that sliced sausage I see on there? Growing up in New Haven everyone called apizza tomato pie. My wife turned in this tomato pie last year at the Taste of Grand Rapids. It was filled with fresh tomatoes, mayonaise, white cheddar and fresh basil. I baked it in my smoker. It was outstanding. Note - I corrected the ingredients after checking with my wife.